On the plane to Fatima. Watched a FANTASTIC movie about adoption, love, redemption and family just now on the plane. A movie from India. 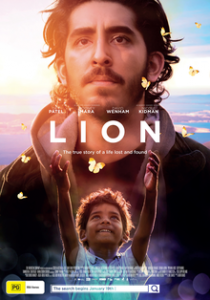 It is worthy of an evening with popcorn and a box of Kleenex..
Oh, it is entitled “Lion” which you don’t find out its meaning until the end. Enjoy! We DID see the dancing sun! I’ll try to write more about this in a day or two once we arrive in Fatima. But I am a believer! In 1982, Pope John Paul II visited the Shrine of Our Lady of Fátima to commemorate the first anniversary of the attempt on his life and the sixty-fifth anniversary of Our Lady’s first apparition there. He delivered the following homily. 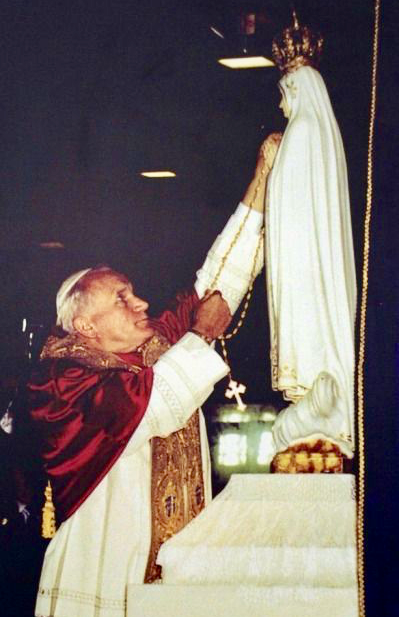 St. John Paul II on Our Lady’s message at Fatima: “The call to repentance is a motherly one, and at the same time it is strong and decisive.” Hail, Mary! These are the concluding words of the Gospel in today’s liturgy at Fátima. The disciple’s name was John. It was he, John, the son of Zebedee, the apostle and evangelist, who heard from the Cross the words of Christ: “Behold, your mother.” But first Christ had said to his Mother: “Woman, behold, your son.” This was a wonderful testament. As he left this world, Christ gave to his Mother a man, a human being, to be like a son for her: John. He entrusted him to her. And, as a consequence of this giving and entrusting, Mary became the mother of John. The Mother of God became the Mother of man. . . .in John every human being became her child. Mary’s motherhood in our regard is manifested in a particular way in the places where she meets us: her dwelling places; places in which a special presence of the Mother is felt. There are many such dwelling places. They are of all kinds: from a special corner in the home or little wayside shrines adorned with an image of the Mother of God, to chapels and churches built in her honor. However, in certain places; the Mother’s presence is felt in a particularly vivid way. These places sometimes radiate their light over a great distance and draw people from afar. Their radiance may extend over a diocese, a whole nation, or at times over several countries and even continents. In all these places, that unique testament of the Crucified Lord is wonderfully actualized: in them man feels that he is entrusted and confided to Mary; he goes there in order to be with her as with his Mother; he opens his heart to her and speaks to her about everything: he “takes her to his own home,” that is to say, he brings her into all his problems, which at times are difficult. His own problems and those of others. The problems of the family, of societies, of nations and of the whole of humanity. Click here to read the rest of St. John Paul’s homily (lightly edited) . . .